THIS week is weekend sketch #95! You'd think I could keep something as easy as what number sketch we are on straight! These days..... well, it's not easy! Hey, at least I was done this week early! Only a couple more weeks and the kids will be back to school and then everything will make sense again... right? That's what I'm telling myself anyway! Check out the sketch team, and Beate's blog for all the details! Hope you can play along with us over the weekend! Stamps: Snow Place Like Home, Snowy Sayings, Parka Penguins (Our Craft Lounge). Paper: Real Red, Basic Black, Designer Paper by American Crafts, Neenah White. Other: Sugar Sparkly Fluff, Appletini Green Sparkly Fluff, Quickie Glue Pen, Chunky Sparkles, Circle Nesties, Label Nesties, Wizard, Red Brad (American Crafts), Crafter's Tool Kit, Zip Dry, Glossy Accents, Scor-pal. 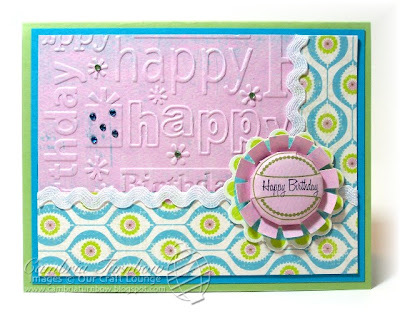 Paper: Neenah White, Dotted Bazzill, Maraschino Cherry Bazzill, American Crafts Designer Paper. Other: American Crafts Ribbon, Circle Nesties, Circle Scallop Nesties, Red Brads, Glossy Accents, Chunky Sparkles, Sugar Sparkly Fluff, Quickie Glue, atyou Spica Pens, Crafter's Tool Kit, Zip Dry, Scor-Pal. Hello stampers! August has just been a crazy busy month! I cannot believe summer is almost over and school time is just around the corner! Does it go faster every year or is it just me? This week is super busy again, with school registration for the kids and a family reunion this weekend at the lake! I'm going to enjoy these last few weeks. So... I was thrilled when I came home with my new iTop brad maker. I was even happier when I discovered that the small brads fit all the centers of the flowers in our new set called Friendly Flowers. The large brads fit our Tag, You're It! stamp set. How cool is that? One thing that was driving me crazy though... I was having a hard time getting the centers completely lined up in the center of the brad after I punched it out and went to make my brad. I got out my Eclipse masking tape to mask some of the flowers, then a light bulb moment hit me! I was doing a happy dance when it worked! Paper: Bo Bunny Mango Luau Dude, Suede Brown Dark Prism, Neenah White, Pumpkin Pie (SU!). Ink: Ranger Soot Black, Copic Markers, Coffee Bean Brilliance, Versamark Dazzle. Other: Quickie Glue Pen, Real Juicy Orange Sparkly Fluff, iTop Bradmaker, Small Punch, Small Brads, American Craft Ribbon Haute Composure, Eclipse Masking Tape Circle Nesties, Circle Scallop Nesties, Craft Knife, Zip Dry, Scor-Pal. Kisa and I had our monthly workshop down at Memories of Time on Friday. We always have SO much fun. 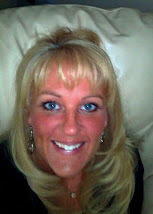 The staff and owner Michelle are just WAY fun to work with. It's the highlight of my month! 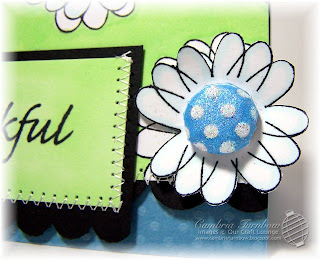 The featured stamp set this time was Friendly Flowers. We made a super cool flower pot card that Kisa designed. She tweaked a pattern that was on SCS. You can see her project here, and also find a link to the pattern she made. Before we started class, I showed our peeps how to do quick easy masking. My favorite masking tape is by Eclipse, it's awesome. It comes in a big roll. You roll out a piece, stamp your image, then cut it out. You will never get a little line like you do sometimes with paper. 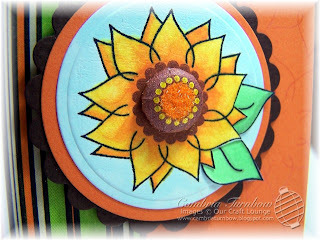 Stamp your flower on your cardstock, cover it up with your mask making sure it's lined up perfectly, then stamp again right over the top of your covered up flower. Remove the mask, cover the flower you just stamped with the same flower mask, then repeat. The cool thing about the Eclipse masking tape is that when you are done, just stick it to your panel! You can use it over and over and over and it will never tear your card stock! After you I got my flowers stamped across my white cardstock, I outlined them with the brush end of my sketch Copic maker (YG11). Then, switched ends to the chisel side, and continued to color the rest of the white space green. I outlined the center part of my petals with they B0000 marker. I LOVE the new soft Copic colors! It's very subtle, but just enough to make the white really pop! I raised up one of the centers with my iTop bradmaker tool. All the centers in our set fit the small brads! How cool is that? I discovered a little tip on how to get them centered every time too.... I'll share that with you tomorrow! Last, but not least, I stamped one more flower, cut out the center portion, stuck the brad through that piece and the main flower, then added some Sparkle to that center with our Sugar Sparkles! I added some glue with my Quickie Glue Pen to each polka dot, than dumped on the Sparkles. Easy Peasy! The sentiment is from our set called Thankful Flourishes. Hope you had a great weekend! I register the other three kids for school this week, then we have a our annual family reunion a the lake this weekend... it's going to be another busy summer week! Hope you are enjoying the last days of summer! Thanks for stopping by! Good morning! Sorry I'm late with the sketch this morning! I got it done yesterday, went to register my daughter for school, started prepping for our class tonight at Memories of Time, went to post last night and my internet was down. So... got up at 5 am to come down and post, realized I had done NEXT weekend's sketch! DOH! Ever have those days? Head over and visit Beate for all the weekend sketch details. Thanks for the fun sketch Beate! I got this cool new tool at CHA called the iTop by Imaginisce. It's SUPER cool! 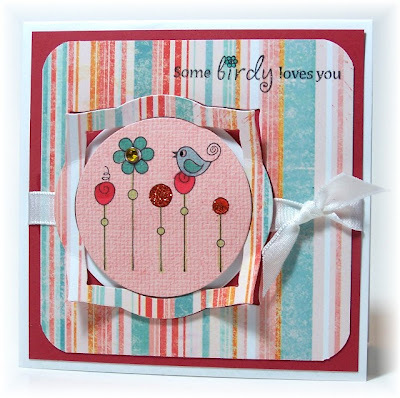 The small brads fit all the centers from our set called Friendly Flowers.... how cool is that? You can make your own custom brads! At CHA they even used material... it's a very cool tool and easy to use! I cannot wait to find more time to play with it more! Check out the rest of the sketch team to see what they created with this fun sketch! Paper: Bazzill Dotted Blue, Neeenah White, Basic Black. Ink: Ranger Soot Black, Copic Markers, YG11, B0000, Brilliance Pearlescent Sky Blue. Other: iTop, Small Brads, Sugar Sparkles, Quickie Glue Pen, Janome Sew Mini, Dotted Ribbon, Square Scallop Nesties, Long Scallop Punch (SU! ), Scor-pal, Zip Dry. Another one of my favorite sets from our Holiday Release. I LOVE coffee, but the sentiments from this set is what set me over the edge! 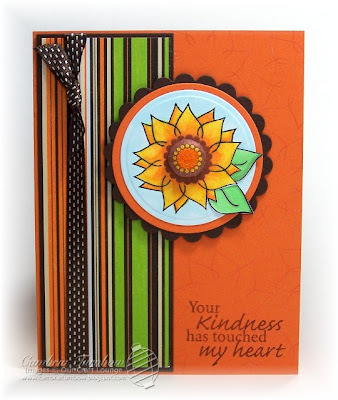 On the OCL blog each week, we have a Spotlighted Set of the Week. Our DT members take turns "spotlighting" a set. All week, you can check in and see samples of Fueled by Caffeine, and we hope you'll leave a link and share your creations too! Check it out Monday! Paper: Raspberry (SU! ), Brown and Green by Bazzill, and Neenah White. Other: Circle Nesties, Jody's Foam Dots, Bazzill Mini Brads, SU! Ribbon, EK Circle Border punch, Black Sakura Glaze Pen, Zip Dry, Scor-Pal. Her tail is covered with Coffee Bean Brown Sparkly Fluff. I just used my Quickie Glue Pen, colored the tail, dumped on the Sparkly Fluff, then tapped it off. Image is colored with Copic Markers and the cool shapes are made with my Wizard and Spellbinder Nesties. Rhinestones were added to the sentiment. Paper is from Bo Bunny called Mango Luau Dude. The stripes are one side, the flowers the other. Isn't double sided paper THE best? My LSS Memories of Time is carrying the entire Holiday Release, plus something extra special... exclusive even. My lips are sealed, but it should arrive in the store the next day or two. Kisa and I will be doing our class later this month (August 21st), so hurry down and sign up! We always have SO much fun! I'm back to work on Scrapfest projects, and samples for stores, but I'll see you tomorrow for the Weekend Sketch Challenge! Have a great day, and thanks for stopping by! Good morning Stampers! Hope you are having a great week so far. 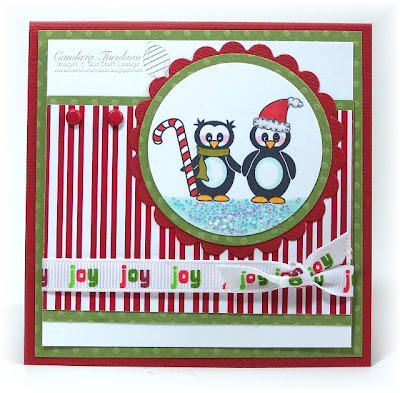 Today, I'm showing you a card using the stamp set Tweet Winter Wishes. I adore this set! A little coloring, some OCL Chunky Sparkles, and some Sparkly Fluff and you're done! I added the Sparkles by using Glossy Accents then dumping them on, tapping them off. Cotton Candy Pink Sparkly Fluff on the mittens and scarf. Very easy to mass produce and it has very cute sentiments to get you through the entire winter. :) You can see the entire set here. Want to see the entire Holiday Release from Our Craft Lounge? Click here. Paper: My Mind's Eye, Bazzill Pink, Prism Blue, Neenah White. 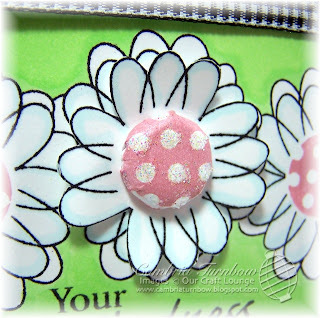 Other: Rhinestones, Zip Dry, Glossy Accents, Jody's Foam Dots, Oval Punches (Stampin'Up! 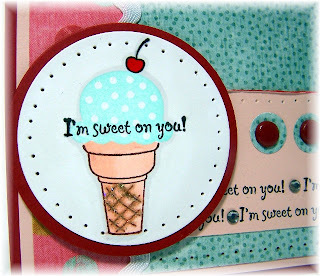 ), Cotton Candy Sparkly Fluff, Quickie Glue Pen, Gingham Ribbon, Ribbon Slot Punch (Stampin'Up!). Hey Stampers! Hope you are having a great weekend! 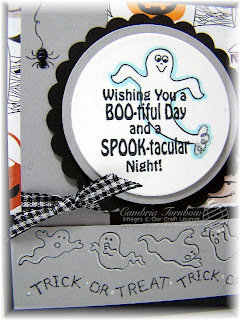 Today, I'm showing you one of my Halloween cards. I love making Halloween cards! This one is 4 1/4 x 4 1/4. 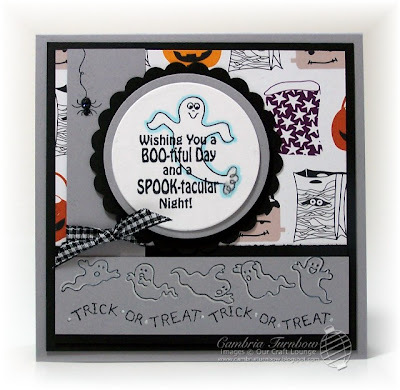 I used the stamp sets, Spook-tacular and Spooky Borders. 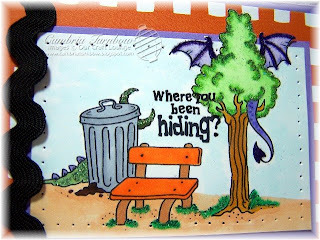 For the main image, I stamped the ghost from Spook-tacular on to Neenah White cardstock, then stamped the sentiment from the same set right over the top. I used my Circle Nesties to cut him out, and for the layered behind him. I outlined the ghost with my Copic Marker B00. I used a Quickie Glue pen on the bottom of the ghost and added some Sugar Sparkly fluff. I did the same thing to the spider hanging on the side. Add glue with the Quickie Glue Pen on the body and head, then dump on Black Eyeliner Sparkly Fluff, then tap off and let dry. You can click on the photo to see a bigger version. The ghost border from the stamp set Spooky Boarders is stamped twice. Once with Ranger Soot Black, then over the top again with Stampin' Up's Whisper White. I added little dots over the black ones that stamped out with the sentiment with my Inkssentials Opaque white gel pen. The main image is popped up with Jody's Foam Dots. It's not too early to start thinking about Halloween. I'm going to be thinking about treat bags over the next few weeks and get a head start on that for Averie's classroom. I'm always doing that last minute and it kills me. Let's see how my plan works! Wish me luck! Paper: Date Swirl (Bazzill), Basic Black, Neenah White, American Crafts Halloween Costume Party. 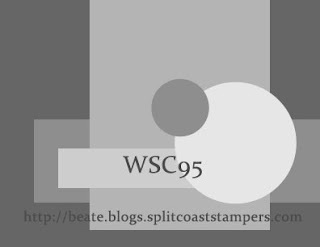 Ink: Ranger Soot Black, Stampin' Up! Whisper White, B00 Copic Marker. Other: Quickie Glue Pen, Sugar Sparkly Fluff, Black Eyeliner Sparkly Fluff, Circle Nesties, The Wizard, Marvy (pink) Scallop Punch, Black Gingham, ZipDry, Jody's Foam Dots, Scor-pal. If you are looking for the blog candy winner, it's in the previous post. 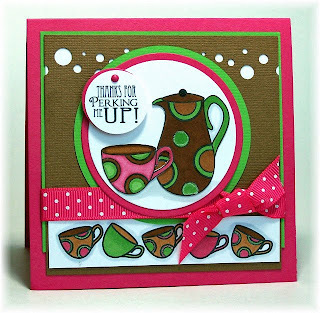 Thanks SO much for making our blog hop Holiday Release such a huge success! See you soon! 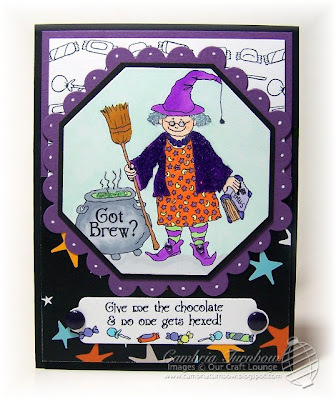 PS... did you see the link on the OCL blog to Marianne's coloring tutorial? VERY cool! Congratulations Stephanie! Please email me at cambria@ourcraftlounge.com with your shipping information and Tag, You're It will be on the way to you! There will be a complete list of winners on the OCL blog on Monday! Click here to see all the winners! Thanks so much for all the sweet comments and your excitement over our Holiday Release... we all appreciate it GREATLY! Hey Peeps! It's Friday! TGIF! Today's weekend sketch is hosted by Sharon! Please visit her blog to see the sketch. Hope you can play along! Today, I'm using a sweet little stamp from my friend Taylor that she gave me at the SCS booth at the CHA Supershow. I got to hang out with Taylor and her Mom quite a bit on my visit to Orlando.... it was awesome. They are both SO sweet. Taylor is having a release this week, so if you haven't already been over to check it out, head over there! Love her cute stamps! I made this little frame from the Labels Three Nestabilities. Just lay two together and run them through at the same time. It's popped up on Jody's Foam Dots. Then, I pulled up on the corners a bit. The flowers are colored right on the flip side of the designer paper. I used a Rhinestone in the center of the biggest flower. Two of the flowers are covered in Juicy Orange Sparkles. The sentiment is outlined with my Stardust Pen, to add some glitter. Designer paper is My Mind's Eye. Cardstock is Riding Hood Red (SU!) and Neenah white. 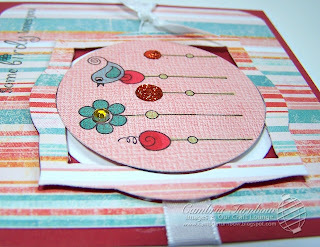 Ribbon is also from Stampin'Up! Oh, you see those nice corners? Another very cool tool that I got to play with at CHA. Have you seen The Corner Chomper? Oh man.... talk about cool. One side does 1/4 inch, the other does 1/2 inch. It cuts through anything... like buttah. We R Memory Keepers iscoming out with four new designs! I can't wait to get my hands on those! I LOVE the Chomper! Okay... so here are the sketch girls... can't wait to see what they did with Sharon's fun sketch! Don't forget the blog candy in the previous post! If you didn't already leave a comment, make sure you do so that you can have a chance to win the Tag, You're It! stamp set. Hope you have a wonderful weekend... thanks for stopping by! Thanks for visiting the new OCL blog and for playing along this week to sneak peek our new Holiday Release! Today is the day! Today, all 31 sets are released to retailers! 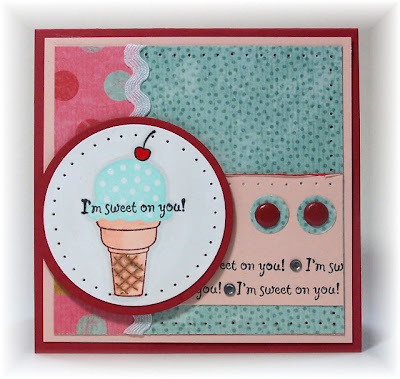 So, check your local Scrappin'/ Stampin Stores or visit your favorite online retailers to get these fun new sets. If you are in my area, Memories of Time is carrying the entire line! Click here to a list of retailers who carry Our Craft Lounge products. 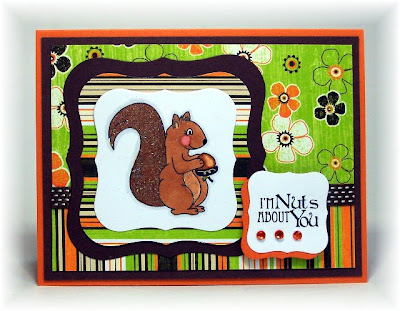 I'm showing you the stamp set called Tag, You're it! Perfect for the holidays or any occasion. Leave me a comment here on my blog and let me know which set is your favorite. I'll draw a winner on Sunday approximately Noon (pacific time). This set could be yours! Check out The Lounge, for a complete list of bloggers who will be each giving away one new set! Thanks so much for all the nice comments and your excitement about our Holiday Release! One of the cool things I saw at CHA was a new tool from Imaginisce called the ITop Bradmaker Tool. See the center of the flower? It's the large brad. I stamped my sentiment from the Tag, You're It! stamp set, then punched it out with the large punch, then made my brad to go in the center. See pink flower around the brad? That is the punch for the next size down (medium). Under that is a die cut that matches the paper from My Mind's Eye. The pink paper is the reverse side of the designer paper. 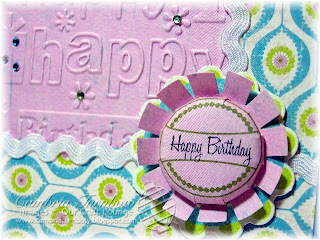 I ran it through the Happy Birthday Cuttlebug folder, then added green and turquoise rhinestones to flower centers and holes in the present. You can click on the photo to see a larger view. Pretty cool huh? That brad maker fits a lot of our new stamps, so I'm excited to play with it more! Okay, so what are you waiting for? Go check out the rest of the sets for your chance to win! Good Luck! Thanks again for your continued support! See ya soon! So.... what do you think so far? Do you have a favorite? Just wait until tomorrow when you get to see the full sets and you'll have a chance to win! I'm excited about that... I love the blog hop give aways! This set is another one illustrated by Marianne Walker. Actually two sets... I used the Spooky borders for the candy background on the top. I love Granny! She is SO sweet and spunky! 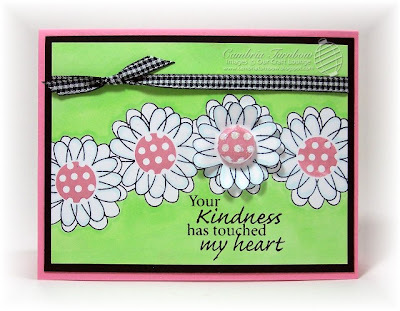 Some of the sentiments with this set just make me smile! I can't wait to show you the whole set. 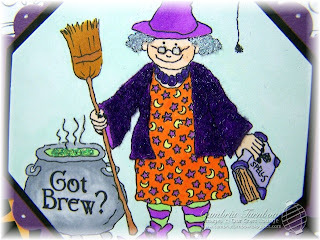 Granny's sweater is all blinged out with Punk Purple Sparkly Fluff and her brew is bubbling with Appletini Sparkles. Her Granny glasses are covered with Glossy Accents. Those large brads are from American Crafts along with the designer paper along the bottom. Please head over to The Lounge for a list of all the participants with links to more sneak peeks of new sets that will be released on Thursday to retailers! Thanks for stopping by and thanks so much for the sweet comments! I hope to feel much better tomorrow. See the full Holiday Release here! Hey! Sorry no post yesterday. It seems I picked up a bug on my way home from CHA. I'm not feeling so good. :( I promise to fill you in on some of my favorite new things, as soon as I feel a bit better. Today is day 2 of sneak peeks from our new Holiday Release. Please head over to the OCL Blog for a schedule of participants and stamp sets that are being peeked on today! Make sure you don't miss out on Thurday's big blog hop give away! We are giving away one of each new stamp set! 31 total! This set is illustrated by Marianne Walker and it's called Peek-a-boo! Have you tried our Sparkly Fluff yet? It's SO much fun and so easy to add dimension and touchability to your projects. I added it to the tree (Appletini Green) and the grass (Irish Green) and the monster in the tree (Punk Purple). I also added some of our ultra cool Sparkles to the monster hiding behind the trash can. I applied all of it with my Quickie Glue Pen from Sakura. Check with your local scrapbook store, or your favorite online store to see if they are carrying our new Holiday Release! All the stamp sets will be available to purchase on Thursday but only through retailers! You know my favorite stores will have them all... including Memories of Time in Coos Bay! See you tomorrow for more sneak peeks! Thanks for stopping by! CHA was a blast! I had THE best time! I have a lot to share with you! I just got home late Saturday, so I've had lots to catch up on. 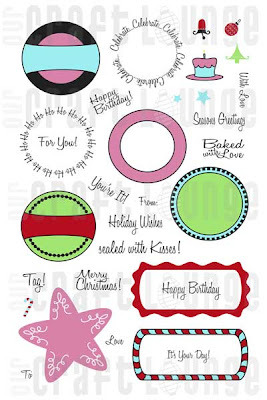 I hope to post later today and show you a sneak peek of our new Holiday Release stamp sets and share some new products too! 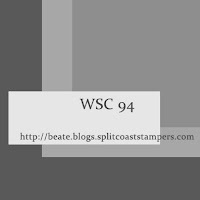 I'm happy to announce that we now have an Our Craft Lounge Blog! Hop over and check it out! Click here! It's brand new, so hang with us until we get it just right! You'll want to stop by there today because today our sneak peeks officially kick off! We have 31 new sets releasing! Today, through Wednesday you'll see sneak peeks from some of your favorite designers. On Thursday, we have our big blog hop give away! Yep, we are giving away 31 free sets! Also on Thursday, our entire Holiday Release will be available to purchase from our retailers! So, check out your scrapbook stores and favorite online retailers to see if they are getting our new release! What are you waiting for? Check it out!!! Thanks for stopping by! See you later this afternoon.